A blood test may be able to sound early warning bells that patients with advanced melanoma skin cancer are relapsing, according to a study (“Application of Sequencing, Liquid Biopsies and Patient-Derived Xenografts for Personalized Medicine in Melanoma”) published in Cancer Discovery. Scientists from the Cancer Research UK Manchester Institute studied the DNA shed by tumors into the bloodstream (circulating tumor DNA) in blood samples from seven advanced melanoma patients at The Christie NHS Foundation Trust. 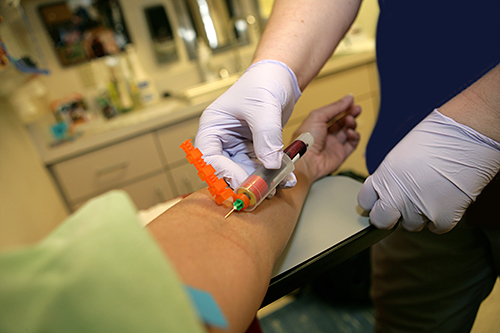 In this early work, they found they could see whether a patient was relapsing by tracking levels of circulating tumor DNA. And they found that new mutations in genes like NRAS and PI3K appeared, possibly causing the relapse by allowing the tumor to become resistant to treatment. Most melanoma patients respond to treatment at first, but their cancer can become resistant within a year. It is hoped that these approaches will allow doctors to use circulating tumor DNA to tailor treatment for individual patients to get the best result. Around 40–50% of melanoma patients have a faulty BRAF gene, and they can be treated with the targeted drugs vemurafenib or dabrafenib. But for many of these patients the treatments don't work, or their tumors develop resistance after a relatively short time. When this happens, these patients can be offered immunotherapy drugs including pembrolizumab, nivolumab, and ipilimumab. Detecting this situation early could be key to improving their care and chances of survival.